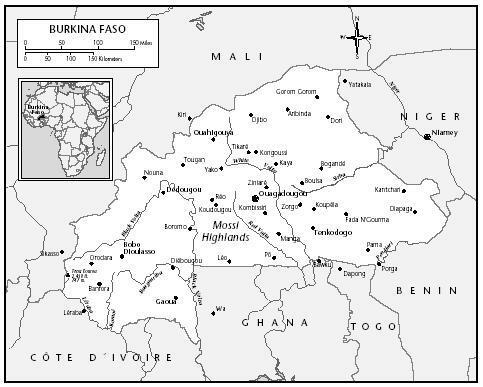 The Bwaba people are spread out over Burkina Faso and Mali in a zone that stretches from Sofara in the north and San in the west to Houndé in the south and Dédougou in the east. They constitute a minority group of approximately three hundred thousand people, or eight per cent of the total burkinabé population. Their language is known as Bwamu and possesses eight different dialects. They are surrounded by peoples whose culture is based around either their villege, or their clan. The fertile banks of the Mouboun river are also the destination for a large number of immigrants from the Mossi people, an ethnic group with a feudal culture that is the largest in Burgina Faso. Cultural differences correspond to the places where the different groups live in relation to the Mouhoun river. The Bwaba Kurusye, the Kyohsye and the Bweesye, all located under a loop af the Mouhoun, differ from the Bwaba who live on the ”other side of the river”, the Moukyohosye who have influenced by the Dioula culture. The name of the town Dédougou means ”I am proud and happy”. The people of Dédougou owe their plentiful harvests as much their enthusiasm for work and ther strength as to the quality af their lands. The musicians are called kakàra in Bwamu. They themselves use the term kambaro yarowa, the people of the kambaro, taking their name from the thorn tree that grows in the courtyard of every kakàra family. They form a reparate caste and only marry amongst themselves. They are the guardians and preserver of their oral traditions and the musicians for every social occasion; beyond this they are weavers. They fulfil the important position of mediator in conflicts between couples, families, or the whole group, and also serve as intermediaries when engagements and marriages are being arranged. The education of young kakàra is very strict; they are trained to play all the various instruments from childhood and must learn the different rhythms and melodies without any margin for error. The most typical instrument is the xylophone known as tyoni. Another xylophone called balan is also used by Bwaba musicians. The drums come in several shapes and sizes. The smallest is the dumazo or dondonzo, an armpit drum made from the trunk of the kapok tree in shape of an hourglass; its two goatskin membranes are held in place by a network of doeskin cords. The skin tension can be changed by the pressure of the arm on the binding, allowing the player to modulate the instrument’s sound and to make the instrument ”talk” when struck by a beater with a curved head. This drum passes on orders and messages. The two other drums are also carried on the shoulder; they are cylindrical in form with two skins stretched tight and played with two beaters. The larger is called kinki and the smaller kinkizo. There are also transverse flutes approximately forty centimeters long with two or three holes; they are related to those used by the Peul, although the Kiensé musicians do not use them. The playing of these instruments is reserved for the kakàra alone.